Whether an all terrain vehicle (ATV) is used in an industrial (workplace) environment or for recreational purposes, safe-riding practices should be followed. 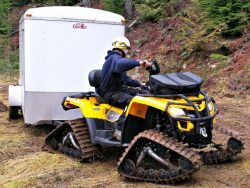 The Canadian Safety Council ATV Rider course is a nationally recognized program developed, for the benefit of both industrial and recreational ATV operators. Completion of this course has become mandatory in many major companies for employees and sub-contracted personnel who use an ATV on the job site. Join our Canada Safety Council certified instructors in a hands-on, informative, and fun course designed to provide you with the confidence to tackle the back country on your ATV/UTV. Our instructors have years of experience and skills which are passed on to our students in a fun, efficient and effective manner. 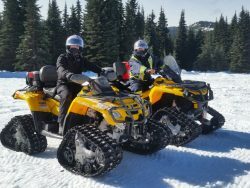 BackCountry Safety Training’s provides our unique Snowtracted ATV/UTV course which incorporates elements of the snowmobile safe operator program into the Canada Safety Council’s safe operator ATV/UTV course. By melding these programs together we believe we provide the most comprehensive snowtracted ATV/UTV education available to date. 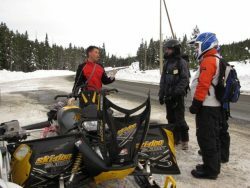 Join our Canada Safety Council certified instructors in a hands-on, informative, and fun course designed to provide you with the confidence to tackle the back country on your snowtracked machine. Our instructors have years of experience and skills which are passed on to our students in a fun, efficient and effective manner. 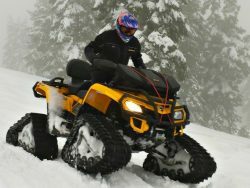 The Safe ATV/UTV operator course, whether is Recreational, Industrial or Snowtracted will increase rider knowledge, skills and confidence while reducing accidents and injuries. 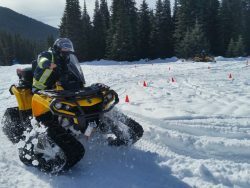 The All Terrain Vehicle Rider Course is a one-day program designed to train the operator in the safe and efficient use of an all terrain vehicle. The course includes both classroom and practical training, with the greatest emphasis on operational skills. We also do custom corporate training of employees –we can bring our course to your site. All students must provide their own mechanically sound ATV and appropriate riding gear. The skills you learn will save you time, money, effort and most importantly, will help keep you save. 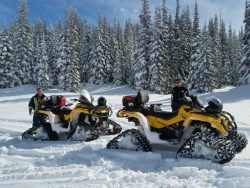 BackCountry Snowmobile’s mobile service allows us to offer flexible Locations and Training Dates to meet your needs. Please contact us to set up training in a location and on a date that best meets the requirements of your workplace and employees.